Homes and commercial buildings located in historic or preservation districts throughout the U.S. are rich in history and have long-standing cultural heritage and architectural significance. Homeowners often are very limited in the scope of renovation work they can perform on these structures. The decision to replace damaged wood cladding with new vinyl or cement board siding should be weighed carefully so you don't run afoul of any local rules or regulations pertaining to the preservation of historical buildings. Buildings located in historic districts from Boston, Charleston, S.C., or Virginia City, Nev., are tightly regulated for any type of changes to the exterior design of the structures. For example, contractors seeking a building permit for work on a building in any of Boston's nine historic districts must submit an application about the scope of the work for review and approval by the city's Historic District Commission. Sometimes, though, the well-aged wood clapboard cladding on these buildings has deteriorated to the point that it needs replacing. Selecting the appropriate building materials is a decision that merits careful consideration. 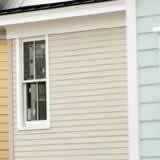 In many instances in historic districts throughout the U.S., homeowners have chosen new vinyl siding or fiber cement siding as a replacement to deteriorated wood clapboards -- a move that has preservationists in arms. Their argument: New vinyl siding styles and cement board siding styles don't accurately reflect the detail, shadowing and other characteristics inherent in the original clapboard or shake siding, and as a result, they diminish the structure's historical significance. Historical structures, preservationists say, should be repaired through preparation and painting of the exterior building materials. Homeowners counter with the high costs of such preservation work, and the continued maintenance issues versus the relative lack of maintenance with new vinyl or fiber cement siding. The National Park Service suggests using aluminum or vinyl siding only if the existing wood cladding has deteriorated to the point it cannot be repaired, and the new materials don't degrade the architectural features and character of your structure. Substitute materials should match the original materials in size, finish and profile, the NPS says. The best way to ensure you purchase the proper building materials is to contact the historical district that oversees your neighborhood and learn about its guidelines for remodeling work. Another good way to make sure you are on track is to discuss your renovation plans with a siding contractor in your area. Local pre-screened and certified building professionals such as those found through this site typically are familiar with the requirements of remodeling work in your neighborhood and can help you make informed decisions.